Low earth orbit systems aim to bring the internet everywhere. They’ll need interconnection. It’s in our phones, TVs, toasters, cars, watches, toothbrushes – even in the soles of our shoes. The internet is everywhere. Right? Well, no. About 47 percent of the global population of 7.6 billion people doesn’t have internet access, as tough as that is for those of us in internet-rich locales to imagine. But companies are working on ways to bridge this digital divide, and systems based on low-earth-orbit (LEO) satellites are becoming a big part of the conversation. The benefits of satellite internet are obvious in places where land-based network infrastructure doesn’t exist. But while systems based on high-orbit satellites need only minimal ground equipment to reach remote places, a range of complications – including cost, speed and performance – prevent them from being a global solution. LEO systems aim to get past the problems by getting closer to earth. The prospect of a truly global internet is alluring, not just to those driven by altruism, but also to internet companies who’d love more customers (Facebook among them). That’s helping efforts to create LEO satellite networks gather steam. People began dreaming about LEO internet systems because they wanted to expand on the capabilities offered by existing satellite options. Today’s satellite internet systems transmit signals from fixed locations 22,000 miles over the earth to a ground station, then to a small antenna at the subscriber’s location. It’s a long trip, and subscribers pay for it in various ways. Beyond the obvious bandwidth challenges, distance increases latency, which can result in lag and degrade performance. And since satellite bandwidth is a valuable commodity, providers place limits on how much data customers can use at different times. Finally, there’s price. The fastest plans can cost several hundred dollars a month. The rationale for developing LEO satellite internet solutions is based on a simple calculation: Satellites operating closer to users support better performance. Of course, being closer (anywhere from 100 to 1,200 miles away) means that the satellite signals can’t cover as broad an area. But LEO satellite internet providers plan to compensate with more satellites, and say they’ll launch hundreds and even thousands of them in “constellations” that can provide the coverage they need to reach subscribers. The more advanced satellites populating these constellations will allow for faster connections and greater bandwidth. And that bandwidth will be augmented as technology continues to improve, enabling more efficient use of existing spectrum through techniques such as spectrum sharing. More affordable satellites and launches. OneWeb and its manufacturing partner Airbus say their satellites cost a relatively affordable $1 million each, while a single launch of SpaceX’s reusable Falcon 9 rocket is estimated to cost $36.7 million. That’s a bargain, considering a single satellite launch using traditional methods can cost as much as $400 million. Tolerance of failure. Space X founder Elon Musk says that in a constellation of thousands, the failure of a few satellites isn’t as important, since the other satellites will route around them. The increased tolerance of failure lowers manufacturing costs. Cost-effective “pizza boxes.” The consumer ground stations needed to receive the signals are inexpensive, easy to install and small enough to be nicknamed “pizza boxes” because that’s what they resemble. 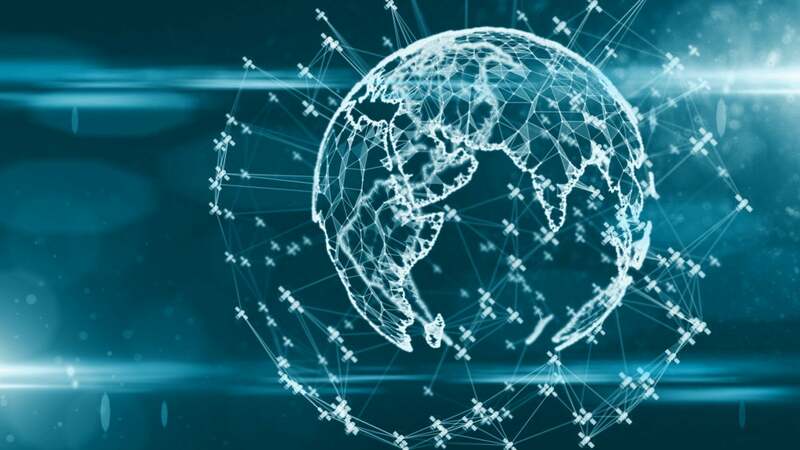 Even if constellations of internet satellite successfully go into orbit, the systems will need highly interconnected networks on the earth. That’s because LEO satellites are non-geostationary, meaning they aren’t in a fixed location over the earth, but continuously pass overhead. Coverage is achieved through constant “handing off” between satellite and ground stations, and that requires a lot of ground-based interconnection points. Plus, the systems all still depend on traditional terrestrial networks. Say, for example, a person sends data that’s destined for Chicago from a remote area in Australia. That satellite is moving when the data hits it, and it needs to bounce through a string of other satellites that are also moving to get to Chicago. This happens using SDN technology, and it’s not always a matter of moving between the points in the straightest line possible. Because these new systems use free-space optics (which rely on lasers rather than radio frequency), clouds can impact transmissions, so weather conditions must be accounted for. That takes a flexible network of ground stations, to enable the system to select a ground station free from weather worries, then pick up a terrestrial network and complete the transmission. A global interconnection platform becomes an essential part of this system. That platform can house and interconnect those ground stations, as well as the range of terrestrial networks that will come into play all over the world. Having everything on the same interconnection platform, linked by the same interconnection fabric, supports the essential secure, many-to-many, real-time connectivity that LEO internet systems will depend on. For the internet to actually be everywhere, it’s going to take more than satellites in the sky. Interconnection on the ground will be critical, too. Jim Poole is the Vice President for Global Ecosystem Development at Equinix. In this role he explores new and emerging digital ecosystems with a focus on how interconnection can be used to strategic advantage by Equinix customers.